Monsieur Truffe 80% Dark Chocolate, is a unique single origin treat. 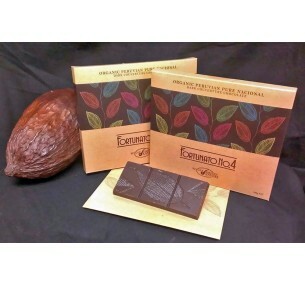 The Fair Trade beans from Ecuador deliver an intense and aromatic chocolate with fruity and floral notes. 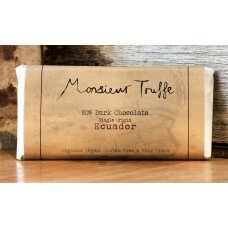 Gluten free, Vegan friendly and Organic, this delectable block ticks all the boxes for a special indulgence. Cocoa Mass (Ecuador Origin), Cane Sugar, Cocoa Butter, Emulsifiant Sunflower Lecithin, Vanilla Extract. 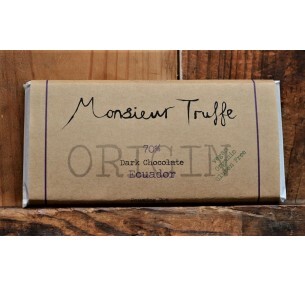 Monsieur Truffe 99% Dark Chocolate, is a unique single origin treat. The Fair Trade beans from Beliz..